Did you guys see the September issue of Elle Decor? 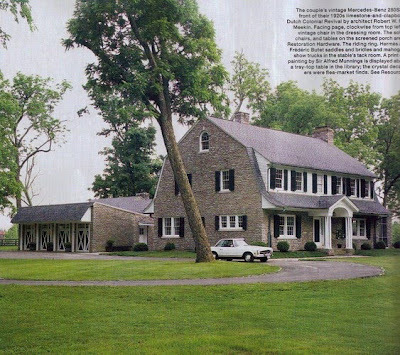 With the Lexington, Kentucky home of Mark Badgley and James Mischka? It's gorgeous... and basically my dream home. The 1920s limestone home was purchased by the couple two years ago. The property, which sits on 15 acres, was completely renovated and furnished with antiques and vintage collectibles. I want it, and everything in it. I'll take the car too, thanks. The stack of vintage Louis trunks, the turned leg table, and equestrian prints? So pretty. Plus, I love how the raised bed makes the room feel airy and clean. Love the all black furniture on the (unpretentious) sisal rug. 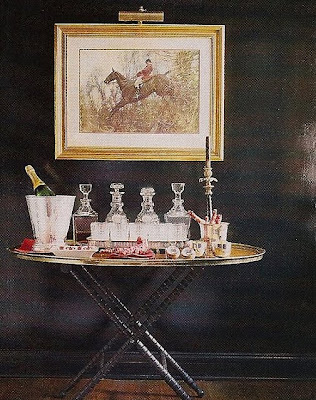 On of my favorite shots from the entire spread: an oval shaped tray table set with beautiful crystal decanters, the black glossy wall and another equestrian print in a gold frame. I love how preppy this is. It's formal but really comfortable, don't you think? 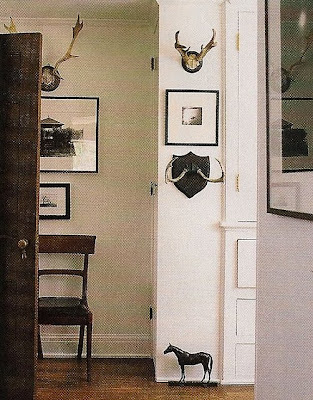 My other favorite shot: vintage antler trophies with skinny black framed art... and a vintage chair. 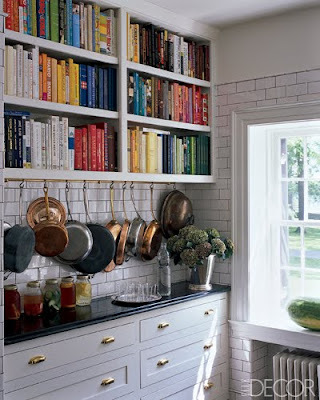 You might remember, I'm not wild about organizing books by color, but this kitchen is really beautiful. Love the brass pulls! Dining in the Library? Love it. And, did you spot the vintage trophy? 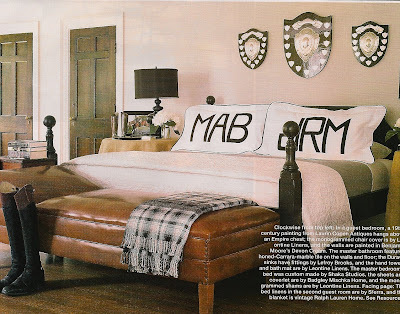 Dark wood doors, light walls, hugely monogrammed pillows... complete with riding boots. 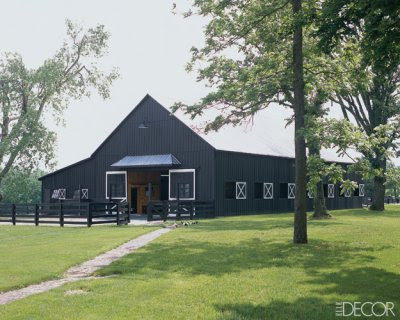 Their beautiful barn. Nice digs for the horses, no? okay, have got to get my hands on that issue already. think they'd let me live in the barn? That house is simply stunning. I was in KY back in February visiting a friend in Louisville and was surprised by how much I loved it. KY is just gorgeous and it's such an interesting blend of Southern and midwestern style.